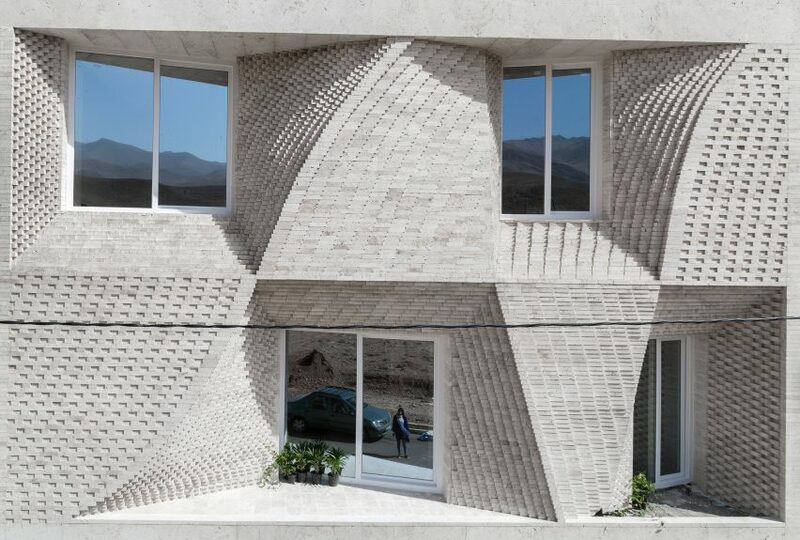 Tehran-based practice CAAT Studio has completed a house for a local stone seller in the city of Mahallat, Iran, with a facade made from local travertine. 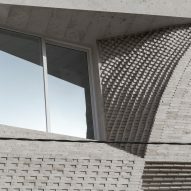 The house is a total celebration of the stone, built from what the studio call "stone bricks", stepped to create a series of waves that move across the facade. The house is in a city located in an area rich in travertine, with two significant quarries – Hajiabad and Abassabad – along with the surrounding mountains visible from the site. 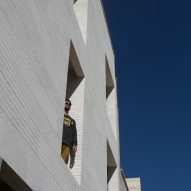 The building signals the stone expert client's business to the city, while his ability to select and cheaply acquire the travertine made the material an economical choice for the project. 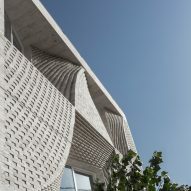 "The majority of Mahallat's economy is engaged in the business of cutting and treating stone, and our client was also a stone expert and independent stone seller," said the architects. "His expertise in in choosing stone at a low price, and this has obviously reflected on the process of the project." 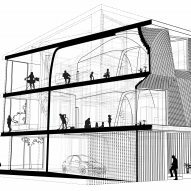 The project started with an existing building, purchased in 2014, with the structure and floor-plates already in place when CAAT Studio took on the project. 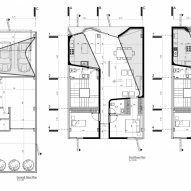 Starting with this simple box, the practice wanted to create a series of spaces that took advantage of the views from the front of the house towards the Sarcheschme copper mine and surrounding mountains, and to the rear of the house to the mountains to the south. 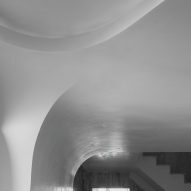 These views through the house dictated the positions of windows, which were then connected via flowing walls, designed to bring a "variety of motion" to the house, with walls blending with the ceiling in what appears as one continuous piece. 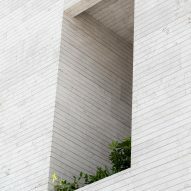 To reduce weight, each stepped stone brick was cut into an "L" shape, with the waste created through this process then used in straight sections of wall. 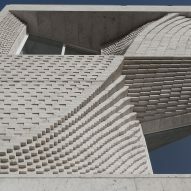 These two, more articulated levels sit atop the entrance and garage at the ground floor, surrounded by vertical stone elements that serve to ground the project. The floor plate visible above has also been finished in stone. 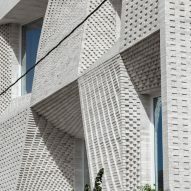 CAAT Studio's housing project in Tehran is another example of stepped, brick elements creating a flowing facade, in this case a brick 'curtain' that wraps apartments and allows for light and ventilation.